It’s all about fun in the sun when you spend a North Myrtle Beach vacation at Palmwood Villas. This North Myrtle Beach resort is just the right size. It is an oceanfront North Myrtle Beach resort that is just three stories high. A limited number of North Myrtle Beach condominiums means a less crowded beachfront and sun deck. 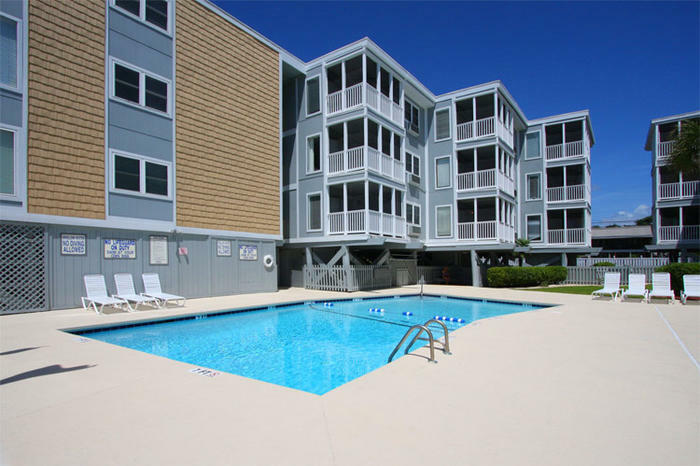 Pick one of the North Myrtle Beach vacation rentals at Palmwood Villas and embrace the oceanfront views, the oceanfront swimming pool and a long list of amenities in each of these condos in North Myrtle Beach, South Carolina. This North Myrtle Beach resort is designed in a staggered layout so all of the North Myrtle Beach condominiums have a nice view of the Atlantic Ocean and the swimming pool area. All of the balconies are screened so you never have to worry about bugs in the evening hours or the safety of the littlest ones in your family. Palms trees dot the beautiful landscape at Palmwood Villas and there is even a covered picnic area on the oceanfront and near the sparkling blue swimming pool so you can play outside and dine outside in comfort. There are a number of North Myrtle Beach rental floor plans for you to consider. You choose which one will work best for your family and your needs. The most spacious North Myrtle Beach condo rental at Palmwood Villas has three bedrooms and three baths. This design can sleep six people and no one will have to sleep on the sleeper sofa. The three-bedroom, two-bath North Myrtle Beach vacation rentals are furnished to sleep either six or eight people comfortably. And the smallest, yet still quite spacious, two-bedroom North Myrtle Beach rental can accommodate four, six or eight people. Some of these North Myrtle Beach vacation rentals are golfer-friendly. Your entire golf foursome could stay at Palmwood Villas and enjoy plenty of privacy and room in which to spread out. Enter these North Myrtle Beach vacation rentals through the front door and you will find the great room just steps away. At the opposite end of the great room in each of these North Myrtle Beach rentals is a wall of windows that includes a sliding glass door. This is the entryway to the ocean view balcony of your North Myrtle Beach vacation rental. Step onto this screened balcony and take in the sea breezes and the scenery. It is a refreshing way to spend any part of your North Myrtle Beach vacation day and the fact that it is a private balcony makes it that much more appealing to guests of Palmwood Villas. Elliott Beach Rentals is not affiliated with onsite management or the HOA of Palmwood Villas.